So far, since 2010, The International Workshop of Urban and Architectural Design has taken place in several cities: Milan, Manila, Jakarta, Seoul, and Bangkok. It has included group work featuring students from Politecnico di Milano as well as the relevant host University. The workshops focused on urban regeneration in contemporary cities and, whilst the analytical appraisal of these cities started in our Design laboratory in the School of Civil Architecture, some projects are still being worked on today, given their topical character. The cities considered are paradigmatic of today’s urban issues and reflect the complexities arising from rapid urban growth in under-equipped urban structures. Consequently, the appearance of these cities has changed dramatically, morphing the latter into metropolitan areas with millions of inhabitants. The initial planning of the workshop started with studies and research with the drafting of design programs and thematic maps. Studies of the cities focused on specific themes: the water canal systems, the infrastructure system, the settlement system. All these aspects were considered as programmatic conditions for the projects developed by students during the workshop. All these project sites offered an opportunity to discuss the theme of urban regeneration – they allowed the development of reflections on design that value contexts with great potential and which are currently in extremely problematic conditions. Mixed group projects combining students – and their relative competencies and skills – from different universities have contributed to the formation of collaborative inter-institutions relationships, paving the way to a well-integrated, inclusive, and successful development of the design workshop. Following this experience, the Politecnico di Milano has planned to establish formal and continuing relationships of exchange on these themes. The theme of a city is widely recognized as one of the central issues for the next decades. 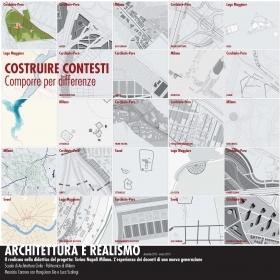 A lot of disciplines approached the study of urban phenomenon and described the city from different points of view. Urban studies have offered different approaches which can be considered an important contribution of our disciplines. For several years, the theme of the city has been attracting the general interest: all disciplines have recognized the contemporary urban phenomenon as one of the necessary areas of application and study. Why should we study the contemporary city? One could say that though historically civilization has been characterized by an urban settlement, during the last century the city became in a certain way coincident with the idea of civilization, or at least with its most vivid representation. The urban matter has also recently assumed the role of epochal relevance: at the beginning of the 1800 only 5% of the population lived in the cities, nowadays 50% of the world inhabitants are concentrated in the cities. According to the forecasts by 2050 70% of the planet population will live in the cities. So, if the city is a field where interdisciplinary contribution converge it can be described from the different points of view. The capacity to describe the city allows understanding contemporary aspects which are useful for different disciplinary fields. Urban studies and architecture in the last decades offered different interpretations of the city, recognizing it as a fundamental object of study and proposing instruments for its interpretation. The knowledge of the city, is a resource for understanding and dealing with the contemporaneity, not only for those interested in architecture. Our work aims to propose the description of the city through new thematic maps which offer different interpretative scenarios, beyond being the descriptive instruments characterized by a selective approach. This aims to indicate the project potential which each city contains in regard to qualification processes. The latter is implemented through carefully chosen thematic cartographic description of the city. The thematic maps refer to the city’s description but at the same time are of a more general value. Each map corresponds to different descriptive intention determined by cognitive necessities. At the same time, the proposed range of maps can't be considered limited, it has exemplary role of the possible descriptive sequence which couldn't be limited. We could say that those representations exclude the possibility of the univocal context and introduce a plurality of interpretations which is unlimited and endless and could be renewed by the project itself through further inquiries. students: (Group.01) A. Bigazzi, G. Jeong, J. Sprott, Y. Yeqiu; (Group.02) N.T. Ferrer, J. Haier, Z. Huang, M. Yang; (Group.03) A. ALbini, D. Ferroni, E.A. Song; (Group.04) S. Cifti, K.S. Kim, A. Pasqui; (Group.05) K.W. Kang, M. Paronuzzi, A. Pirinoli; (Group.06) E. Gallazzi, S.H. Lee, M. Parravicini, G. Suigo; (Group.07) K. Gradinarska, E. Pipkova, A.A. Abdulmohsen S; (Group.08) Giuseppe Brunelli, P.P. Speziale, J. Yoon. students: (Group 01) C. Azzalini, F. Banfi, A. Bigazzi, A. Pirinoli, B.V. Laovisutthichai, P. Thuvavong; (Group 02) I. Curatolo, R. Mangini, G. Mascherin, M. Paronuzzi, N. Pisutpunya; (Group 03) A. Migliarini, P. Jaratnithiporn, A. Pasqui, C. Pischiutti, A. Schiona; (Group 04) B. Casiraghi, C. Cavusoglu, G. Ciusani, M. Di Lizia, J. Sprott, C. Suwanasri; (Group 05) G. Corti, G. Duranti, J. Estrada, C. Gerardi, S. Junsompitsiri; (Group 06) C. Galli, F. Maffeis, L. Marasso, Y. Ramadan, P. Viryasiri. students: (Group 01) A. Dunic, C. Nardi, A. Ponti, C. Ronchini; (Group 02) B. Caccia, V. Campara, I. Kirova, A. Morandi; (Group 03) M. Albertin, G. Cassio, T.O. Nishi, G. Sciola; (Group 04) A. Bortolotti, K. Gradinarska, M. Righi, S. Jie, P. Tomasoni; (Group 05) E. Corti, S.M. Discacciati, I. Menzi, S. Rocha, Q. Wang; (Group 06) C. Ballester, F. Capitani, M. Pelagatti, M. Tornaghi; (Group 07) S. Delvecchio, A. Nifosì, T. Kim, S. Petrolo; (Group 08) S. Bergamin, B. Manzoni, S. Spreafico, C. Yang; (Group 09) M.R. Abate, M. Dagradi, N. Kvanchiani, M. Ventilato.